By improving Masonic education within your Lodge, you, personally, gain knowledge of the craft of Freemasonry. and wholesome instruction for their labors." Hello! My name is Simon Pierce and I'd like to help you learn basic lodge-level Freemasonry via my Fast Track, Fat-Free, Step-by-Step method to save you thousands of hours in your quest for knowledge about Freemasonry, such as How to Become a Freemason or to How To Find a Lodge Near You. Not all pages of this Masonic education website are on the left hand Navigation Bar. If you are in a hurry, click on my SiteMap at the top of the left Navigation Bar to quickly see the index of all the pages. The Mission Statement of this Website is that Masonic education builds Masonic retention. This site is not an official site of any recognized Freemason body in the United States or in the world. It is for informational purposes only. Its contents are those of regular Freemasonry in the United States. It does not necessarily reflect the views or opinions of any regular body of Freemasonry. What is a Fast Track Masonic education? You’re a busy person. You need the right process and the right tools to help you remove the barriers and mysteries of Freemasonry,... correctly applied in a simple, step-by-step, easy to learn manner. This helps you learn Freemasonry basics in a few well-spent hours compared to many frustrating years. Knowledge opens the door to understanding. ...And, much like King Solomon’s wisdom in biblical times of laying a strong foundation for his Temple (edifice); our full understanding of the Masonic Craft becomes necessary to fully embrace its rays of light. The unspoken rules of Lodge Etiquette ...all in one place? What the biblical Masonic Degree Verses within the 3 degrees actually mean…especially the Masonic third degree? Each Masonic lodge officer's duties and his corresponding jewels of office …all on 1 page? How much time would this save you? Masonic education helps you attain a basic education in the craft. Freemason Books - Once you have a basic, foundational knowledge of Freemasonry, there are many Masonic books which will help you to complete your Masonic education. There are thousands of books written about Freemasonry. Many Freemason books are excellent reading resources, however, it can be a lifelong pursuit to truly understand the basic lodge fundamentals of what Masonry is really about. Educating yourself, book by book is a very worthwhile, but usually a tremendously long and time consuming process over many years. However, the process becomes much easier once you have a basic foundation of knowledge on which to build upon. Take action, now, to learn some of the true rewards of Freemasonry…possibly even before your next lodge meeting! Are you your Lodge’s Masonic Education Officer and have quickly come to the realization that your Lodge Library contains absolutely nothing really helpful with which to train a new brother to bring him up in the Craft? Sure, it has quite a few Freemason books...mostly either very old, very deep and scholarly, or whole sets of Encyclopedias of knowledge…but nothing basic enough to help YOU with the job of training a new member. You have at your fingertips pounds and pounds of books filled with Masonic info, but unless you choose to begin reading them aloud to your new members at each of your Education meetings, (snore),... it's going to be very difficult to impart a basic knowledge of Freemasonry in your time allotted. Historically, there are many names for the Lodge. In various lodges around the world, it may be called a Masonic Lodge, a Blue Lodge (in the United States), a Symbolic Lodge, an Ancient Craft Lodge, a Craft Lodge or St. John’s Lodge. All are correct. Lodge Etiquette …learning Lodge Do's and Don’ts? Masonic Words and Phrases like cowan, profane, diurnal, etc.? Are you a new Master Mason? Before purchasing Masonic jewelry for yourself or a loved one, take a few moments to learn what the symbols on Masonic jewelry signify to a Freemason. Are You The Worshipful Master Of Your Lodge? ...Or, perhaps you are the Senior Warden who will be Master of the Lodge next year. You already know a lot about Freemasonry; …perhaps you are even a Masonic scholar. You’re pretty good with Freemason ritual work, but as its Worshipful Master, you are aware that, essentially, you are the CEO of your Symbolic Lodge and would like to make your year be remembered as a great year. So, without having to re-read the entire lodge library; you just want to brush-up on a few things to school yourself in preparation for your year...not only ritual and symbolism, but learn how to prepare yourself to for Lodge administration duties. How to perform proper Lodge Audits. Perform a proper Masonic investigation. Help each lodge committee learn why their specific task is necessary to create a fully functional, harmonious and working lodge. Increase Masonic Education and Lodge Retention through creating an Education Officer position and a Mentor Program, thus fulfilling your Grand Lodge’s expectations. Masonic Education: This is how Freemasonry has survived through the centuries from its members teaching other members. Like your predecessors, you will learn the Freemason symbols which have come down to us through the generations…not just from books, the Old Charges (old manuscripts, Old Charters), engravings and ritual and degree work; ...but through the mentoring (nurturing) of each of its members,… fellow Brother Masons coaching and helping each other in their quest for knowledge. Monitorial Masonic Education: This monitorial education (a method of one-on-one, mouth-to-ear training)...or in this case, one-to-many, eye-to-screen training), is performed by mentors who tutor each new member of the brotherhood in the sometimes archaic (seldom used in modern language) words contained within Masonic books and literature. They teach (inculcate) their brothers about Freemasonry's biblical (Holy Book) history, its age-old tenets (principles), and the discipline and guidance each man needs as we fulfill our moral and social responsibilities to one another. The monitorial education on these pages is performed via a Fast Track (step-by-step, easy-to-read, easy-to-understand), Fat-Free (non-wordy, Get-Miles-Get-Home) methodology. In fact, you will find it to be just the opposite. When you complete your Masonic education studies learned on this website, you will have attained a truer understanding of that which you seek. What is True Masonic Brotherhood? ...As the light becomes brighter, the Holy Scriptures will begin to come alive to you...their pages filled with the very real people who were our ancestors. Jerusalem will cease to be just an ancient city on a map in the Middle East filled with centuries of war and unrest. You will come to understand that Abraham (Father of all the Nations in the world) begat 2 sons: Isaac (ancestor to the Christian and Judaic nations) and Ishmael (ancestor to the Arab nations). With this knowledge, your comprehension of our Creator's true meaning of "brotherhood" across the nations of the world, will unfold. As we plumb the depths of basic Free Masonry; your Masonic education will soon become wisdom. Having learned, yourself, once you feel more comfortable, please pay-it-forward, and choose to become a mentor to the new brothers within your lodge. Point them to this website and then discuss with them what you both have learned. Masonic education creates lodge retention...so, please, don't wait until you feel you have become a "bejeweled" Masonic scholar to begin mentoring others. The next time you are called to Refreshment, feel free to choose one of the numerous topics on these pages and tell your brothers what you have learned, or choose one of the Lodge Talks and present it at your next meeting. As your understanding of Masonic education becomes wisdom, others will request your help, your presence, and your guidance. And...as your step-by-step education continues, it is my sincere hope that you will find this information to be both enlightening and to be of value to you; both within your life and in your journey toward the Light. Joining The Freemasons: If you are not already a Freemason, perhaps you are interested in becoming a Free Mason. Joining Freemasons betters most mens' lives...no matter what their skin color, their income level, their religion, (Freemasonry accepts men from all religions) nor what country around the world in which they live. Freemasonry truly does make good men, better. Note: A Master Mason degree is NOT an online college-type of degree. You may study Freemasonry, online, but, to become a member, you must contact a lodge near you and request a petition for membership (in the United States). If you would like to join the fraternity, (in the United States), contact a lodge near you, the Grand Lodge in your state...or if you see men wearing Masonic emblem clothing, such as Masonic shirts, Masonic hats... Masonic Rings or a vehicle with a Masonic auto emblem, simply ask him if he is a Freemason and request that he put you in touch with someone who can give you more information about membership. To find a Masonic lodge near you, you can perform a web search by simply typing "Grand Lodge" and your state or country. You may then contact the Grand Lodge for more information. Or, go to my Masonic Lodge Locations page. This website does not address Freemasonry's secret grips, passwords, penal signs and ritual work. As they have for centuries, they remain Freemasons Secrets. You will learn these in your Mother lodge…the Lodge in which you were or will be raised to the Sublime Degree of Master Mason. Masonic lodge secrets, such as you have watched on television. Masonic Secrets of the Freemasons which are supposed to be buried beneath the capitol in Washington, D.C.
...You will be deeply disappointed, because Masons don't know any more about them than you do...and only then, what we see on T.V. If your prime motivation to join Free Masonry is to learn the Freemason handshake, your time will truly be wasted. Freemasons secrets lie in the libraries of ancient and historical books and manuscripts around the world,...and most especially in the Holy Books of all the major religions...the Bible, the Torah, the Vedas, and others. ..And from the study of these books, comes true understanding of that which our Creator has set down for us to live by. Masonic education is the study of these books toward living a life that is pleasing to our Creator. It is from this knowledge that the fraternity of Freemasonry has for centuries, made good men, better. This means that Freemasons open their doors to men from all religions...just as the Creator, the Supreme Architect of the Universe hears the individual prayers from each person which He placed on the Earth without judging them based upon the denomination of their personal religion. If, after reading the above, and reading the pages of this website (especially the page entitled "Become a Free Mason") for a deeper understanding of Freemasonry, you are sincerely interested in joining Freemasons;... please re-read Joining the Freemasons, above, for information about the easiest ways to join our fraternity. PAY-IT-FORWARD: If you feel the Masonic Education on these pages has been of value to you, please pay-it-forward and remember your fellow Lodge brothers to help provide them with the fastest way to learn Craft of Freemasonry to help them in their quest. 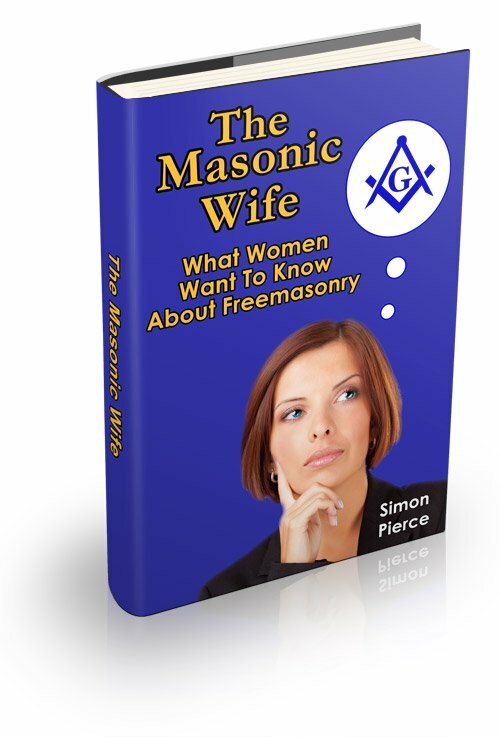 The Masonic Wife answers unspoken questions about the facts and myths surrounding Freemasonry. 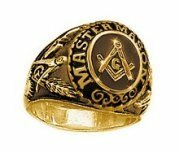 Masonic rings under $ 50. Wear in lodge or when traveling to visit other lodges.